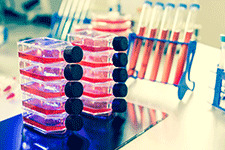 Late-stage and commercial biomanufacturing pose a challenge to cell-culture processing. Cell-culture processes for Phase III biologic drug development and commercial manufacturing present challenges, such as how to optimize cell-culture conditions to maximize productivity while maintaining consistent product quality. Over the years, cell-culture processes have evolved to achieve optimum production yield and quality for both clinical development and commercial manufacturing. Current cell-culture processing has been optimized and has resulted in significantly higher cell densities compared to biologics manufacturing in the past. In the early 1990s, cell titers for monoclonal antibodies (mAbs) were in the range of 50–100 mg/L, notes Dr. Andy Racher, associate director future technologies, Lonza Pharma & Biotech. Today, however, cell titers have been reported at levels in excess of 10 g/L, he says. This resulted from the introduction of parental cell lines better suited to modern fed-batch processes and the development of better bioreactor processes, including control strategies for pH, carbon dioxide, composition of media, and feeds. “The switch from serum-containing to protein-free processes was challenging, but these have generally been overcome. In Lonza’s experience, increases in viable cell concentration and maintaining high culture viability for longer duration have primarily contributed to productivity increases, rather than improvements to vector architecture,” Racher comments. Cell-culture process innovations include platform processes with high productivity and chemically defined culture media, which have helped to reduce process variability and complexity, improve efficiency, and maintain consistent product quality, remarks Michael Laird, PhD, senior director and principal scientist, Process Development, Genentech. Other innovations, such as culture miniaturization with representative systems, permits testing of many culture conditions in a short period of time. In addition, development of intensified processes and integrated continuous processing (with single-use technology and sensors/control) have also contributed to increasing titers, maintaining consistent product quality, reduced cost of goods, and a decrease in facility footprints, Laird says. The ability to maintain a reliable supply chain is one of the challenges in cell-culture processing. The security of obtaining supply for raw materials with the desired profile of contaminants and impurities is one example. “With raw materials becoming ever more purified, trace levels of impurities—which are often enzyme cofactors—play an ever more important role in getting consistent product,” Racher says. It is also challenging to sufficiently understand the different single-use bioreactor (SUB) systems. This understanding is particularly critical for contract development and manufacturing organizations (CDMOs) who have customers that have developed processes in a range of SUB systems, remarks Racher. Laird adds that maintaining consistent product quality while achieving commercial process requirements can be a challenge if cell line or process changes are needed post-Phase I. It is also a challenge to respond to evolving concerns on product quality attributes as new knowledge is gained. Finally, raw material variability, including trace metal impurities in defined media components, has been a challenge to process consistency, he notes. • Increased focus on implementation of single-use technologies and process intensification. • Increased process complexity to achieve higher productivities. • Targeted integration cell-line development to obtain high productivity and consistent and stable parental cell lines. • Efforts on continuous processing, which have been advertised for their capability to maintain process and product quality consistency. • Modeling and leveraging platform knowledge; extensive platform knowledge is enabling more efficient process validation as one study can support multiple products. A platform culture process also enables efficiency during development and any improvements are spread to all projects as the platform evolves. In addition, there has been greater use of systems such as disposable miniature bioreactors to accelerate pre-biologics license application studies and improve process efficiency, says Racher. There is also an increasing emphasis on inline monitoring of nutrients/metabolites and at-line monitoring of product quality attributes, adds Dr. Rajesh Beri, technical director biomanufacturing, Lonza Pharma & Biotech. The goal is to automate process execution and ensure more robust manufacturing, Beri explains. By identifying those process parameters that are critical to getting product with desired quality attributes, process analytical technology (PAT) and realtime process control play a role in optimizing current cell-culture processes. “This should be done before late-stage development; then ensuring those parameters are maintained within the desired target range,” says Racher. “Inline monitoring and real-time control of critical nutrients such as glucose and glutamine lead to more optimal and robust processes, and there is an increasing trend to adopt such PAT methodologies for processes currently at the development stage,” Beri elaborates. “PAT and real-time process control during the development phases can increase process understanding; the data can be used as valuable modeling input; it can shorten the development period for complex molecules or unfamiliar host cell lines (e.g., in-licensed molecules),” says Laird. “In a commercial-manufacturing setting, this can be considered for processing decisions that would ensure more consistent product quality as well as be used for real-time trouble shooting. Something that the industry should strive for implementing,” Laird includes. Anticipated future trends in cell-culture process evolution include the trend toward miniaturization, according to Laird, particularly miniaturization in process development with high productivity. “Miniaturization will quickly transition from early-stage to late-stage development in the industry and shorten the time between entry into humans and product launch,” he remarks. He also anticipates seeing more complex processes and smaller, single-use technology bioreactors for production. “Accelerated clinical development becomes more common and faster, leading to very short times between start of process development and commercialization,” Laird says. “And, with the increased focus on platform processes that emphasize quality and manufacturability early on, one can also envision early clinical processes becoming the commercial process,” Laird states. Racher anticipates seeing greater ability to tune critical product quality attributes and greater use of material from stable, transfectant pools, or pools of clonal cell lines, for drug product development studies, toxicology, and possibly first-in-human trials. Beyond that, Racher says, there is increased incorporation of synthetic biology paradigms into Chinese hamster ovary (CHO)-based expression platforms, moving the industry beyond simply increased titer to greater control and modulation of product critical quality attributes. “There is also a renewed interest in non-mammalian cell-based expression systems for manufacturing antibody mimetics and novel scaffolds, for example, and we continue to develop and refine our microbial platforms alongside mammalian. Whether these systems have the potential to disrupt the CHO hegemony for production of other proteins remains to be seen,” Racher says. “These changes will eventually be at the level of the expression system, so will be introduced in late discovery or early development and will take their time to work through the development cycle,” Racher notes.